As was reported earlier in the week, the promotional event for the twenty-fifth season of the show is now live. This new update brings with it a three-part quest line titled “Conventional Wisdom” which will unlock a special, limited-time building once completed. All of the dialogue takes place between Homer and Lisa, so you will need to keep them both free for this quest line. The first task takes twelve hours, so if Homer is free, it is best to get that started on this as early as possible. The next two tasks only take four hours, so you can complete this all in one day if you are persistent. A limited-time premium item was also added in this update, Hi-Glow Waste Barrels. They cost 40 donuts each and give 2.00% bonus money and XP to all Jobs. It is a 3 × 3 item, and the animation for this item has the small barrel on top rotating around clock-wise, in case you were wondering. Of course this is just a small update to tide us over for the time being. 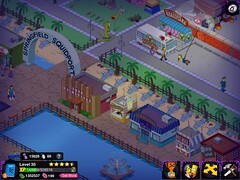 The real fun will begin when the Treehouse of Horror update launches on Tuesday. Before that though, make sure to catch the series finale of Breaking Bad twenty-fifth season premiere of The Simpsons this Sunday night at 8/7c on FOX.